They are just about to build a Costco in our city, dag nabbit! Barnes and Noble are being really difficult ordering books that have anything to do with prepping. When Bug Out first came out in 2010, Barnes & Noble didn't take it into their stores (but Borders and Books-A-Million did. 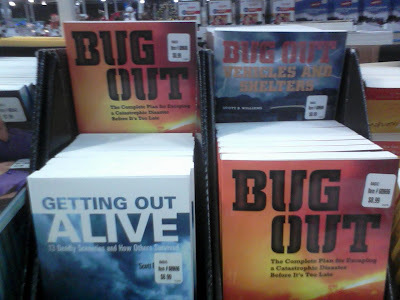 B&N did take Getting Out Alive and Bug Out Vehicles though, and later picked up the first Bug Out, so any branch should be able to get it for you if they don't have it on the shelf as all the books are in their system. Thanks Mr. Williams - I will haunt B&N and see if I have better luck this time. Thanks Jack, glad you liked it. I wrote that one for fun and some of it is outdated now, but coming back from months at a time of living out of the kayak, it was hard not to see things that way. Enjoying the BOV read - will post my review ASAP! Any chance that Sams Club will carry your books? Maybe they are stocking more titles because of the demise of Border's. It's too bad so many bookstores are going out of business. Hopefully, Barnes & Noble and Books-A-Million can hang on. It would be great if Sams Club picked them up, but who knows what these big corporations are going to do. Maybe if Costco has good luck selling them they will. Hey, good news - local Barnes and Noble seems to have caught up, and I ordered both BOV and 13 Survival Scenarios books, should be in next week. Will wonders ever cease. That's great that they could get them for you. Thanks for ordering them and I hope you find them useful. Hey Scott I still have not received a review copy of bug out vehicles yet if you could get back to me when you can I would sure appreciate it. I sent you an email this morning. Just heard from someone else who did not get their copy. I'll get this taken care of ASAP. Could not find Bug Out Vehicles at my local Costco. So I broke down and ordered it through Amazon. Sorry your local store didn't have it, 3rdMan, but thanks for ordering. FINALLY got those two books I ordered from Barnes and Noble (13 Situations Alive and BOV), skimming over them quickly, they look like they will be good reads.